Data scientists do many machine learning or data mining tasks. For such data engineering tasks, researchers apply various tools and system libraries, which are constantly updated. Unfortunately installing and updating them cause problems in local environments. Even when we work in hosting environments such as EC2, we are not free from this problem. Some experiments succeeded in an instance but failed in another one, since library versions of each EC2 instances could be different. By contrast, we can creates the identical environments with Docker in which needed tools with the correct versions are installed without changing system libraries in host machines. This aspect of Docker is important for reproducibility of experiments, and keep the projects in continuous integration systems. However, working in a Docker containers is troublesome. Adding a new library into requirements.txt or Dockerfile does not installed as if a local machine. Specifically we need to create a Docker image and the container each time. We also need to add port forward settings to see server responses such as Jupyter Notebook UI launch in Docker container from our local environments. Cookiecutter Docker Science provides utilities to make working in Docker container simple. This project is a tiny template for machine learning projects developed in Docker environments. In machine learning tasks, projects glow uniquely to fit target tasks, but in the initial state, most directory structure and targets in Makefile are common. Cookiecutter Docker Science generates initial directories which fits simple machine learning tasks. Generally machine learning projects consist of three phases (Experiments, Code simplification, and Deployment). The following is the image of the cycle of a machine learning project. In the begging we do experiments in Jupyter Notebook interactively. Then we simplify the code written in the notebooks. In this step, add test, refactor code, apply linter, make library and CI. After we finished the code simplification, we deploy the model to production use. In this phase, we add batch scripts or service using the library created at the previous step. After deployment, we continue the improvement of model in Jupyter Notebook again. 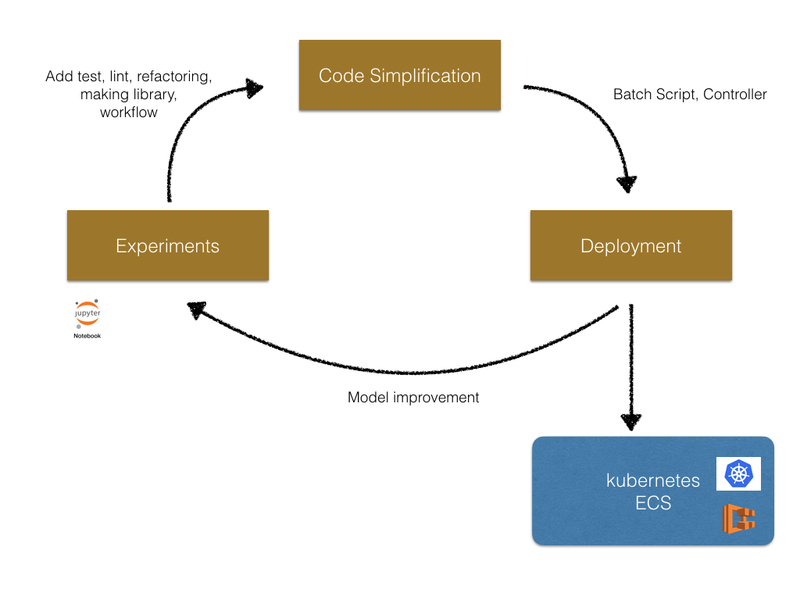 Ideally, we should work in a Docker container in every step of the machine learning projects generated by the same Dockerfile, since we can start code simplification and deployment seamlessly. The following is the image. Cookiecutter Docker Science supports the machine learning projects from the experiments to deployment with Docker container. This section describes the usage of Cookiecutter Docker Science. Cookiecutter Docker Science need the followings. To generate project with the Cookiecutter Doccker Science template, please run the following command. Then the cookiecutter asks for several questions on generated project as follows. To create a Docker image and container and then launch Jupyter Notebook in the container, we run make init-docker and make create-container commands in the generated project directory. Now we are in Docker container. To launch Jupyter Notebook, we run the following command. When we generate a project with Cookiecutter Docker Science, the project has the following files and directories. │   │                                    or Jupyter Notebook. ├── data                              <- data directory contains the input resources. ├── docker                            <- docker directory contains Dockerfile. │                                        if additional library is needed for experiments. ├── model                             <- model directory store the model files created in the experiments. ├── notebook                          <- This directory sotres the ipynb files saved in Jupyter Notebook. │                                        are installed in the Docker container. ├── scripts                           <- Users add the script files to generate model files or run evaluation. └── tests                             <- tests directory stores test codes and the fixture files. The top level files and directories are mounted into the generated Docker container, and therefore when the files are edited in local machines, the changes are immediately reflected in the Docker container. All we need in Docker containers is just run the scripts. As the result, we can edit files any editors as we like. Some data analyst edits with PyCharm other software engineers simplify the results of Jupyter Notebook with vim as the following image. As described in the previous sections, machine learning projects consist of three phases (experiments, code simplification, and deployment). 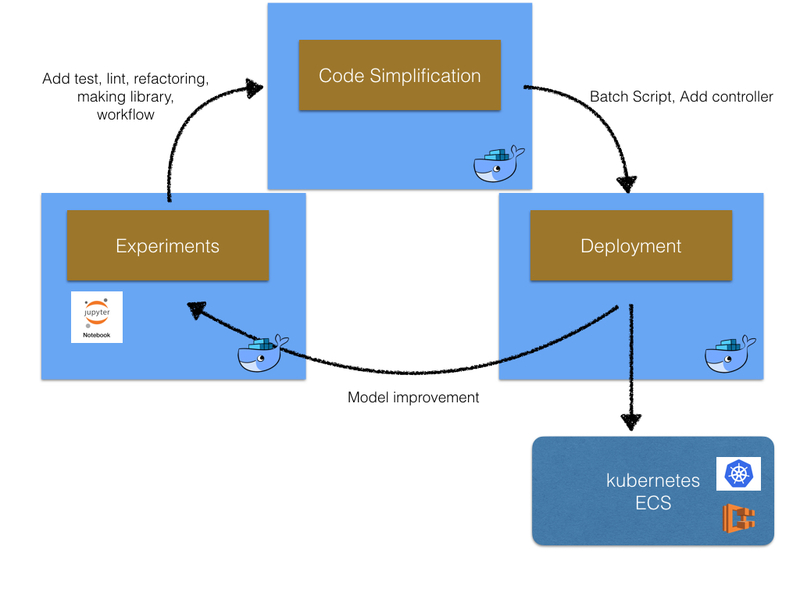 Cookiecutter Docker Science supports machine learning projects in all three phases. Projects start from exploratory experiments. This phase data scientists analysis given data in Jupyter Notebook interactively. Cookiecutter Docker Science launches the Jupyter Notebook server in the container with make jupyter command. Note that port forward setting to connect the port Docker container to host PC is setup by Cookiecutter Docker Science. Users create notebooks in notebook directory and store the results of analysis. In the code simplification phase, users extract components used in the experiments to the library directory. The library codes are stored in the library directory (commonly project name directory) generated by Cookiecutter Docker Science. Then software engineers refactor codes and add tests. The test files are stored in tests directory. The flows to generate the model files are added in Makefile as the targets. Adding the make targets we can generate the model with just make command. After code simplification phase, we deploy the model to the service or batch script. We can make use of the project since the directories in the projects are the same and we are able to generate model with the make command. When we use the project as a library, Cookiecutter Docker Science provide setup.py to upload the library to (internal) pypi repository.